Line of watches Nautica - NST 501 and 102 BFD.Watch brand Nautica, which is part of Timex Group, introduced a new line of watches. 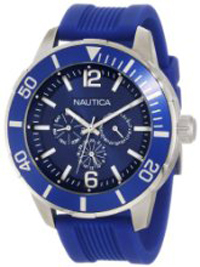 Watch brand Nautica, which is part of Timex Group, introduced a new line of watches. Models are specially designed for those who enjoy water sports. Collection NST 501 turned out pretty dark and mysterious, as sport and the ocean – the main components of the concept of the brand. The line includes models, executed in black and white, black and gray and blue-blue shades, they come on a strap or bracelet. New items are presented in a steel case with a diameter of 46 mm and a thickness of 13 mm. Housings contain unidirectional bezel, and colored dials feature hour-markers and hands coated with luminescent substance. The second line of BFD 102 continues the same marine theme. This time, the line includes the most colorful model. Designers have come to the original design, combining color hour markers with flowers straps. Are very nice skeletonirovannye arrow. 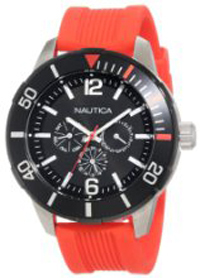 Watch crown decorated with the logo of the brand Nautica – great sports Sailing yacht 30s. Last century.